It’s 2014, ladies! It’s time to get powerful! 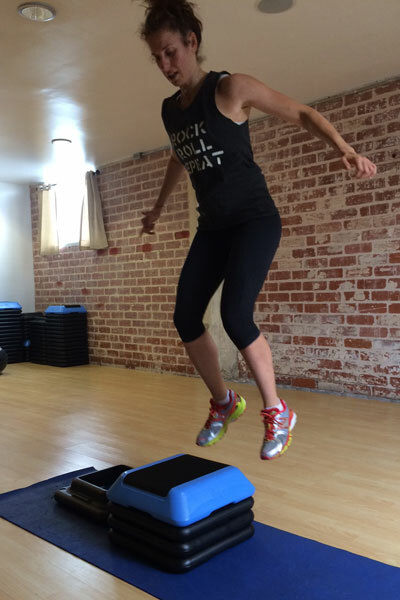 When women want to build strength throughout their entire body, I highly recommend plyometrics. 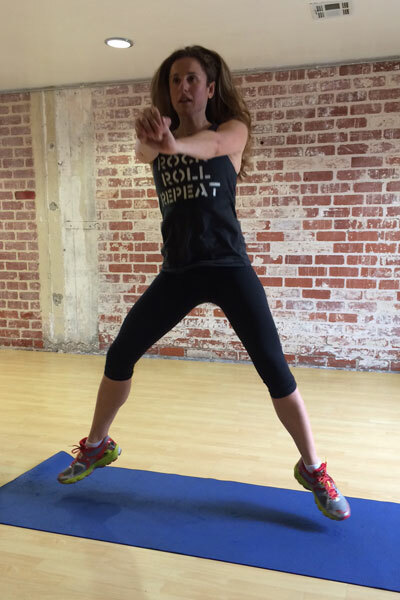 Plyometrics (or plyos) are explosive exercises that use jump training—jump squats, jump lunges, and the like. They strengthen your muscles by working them to their maximum potential in a short window. The goal of any plyometric exercise is to increase your power while also increasing your speed. For example, if you’re doing box jumps, aim to increase the number of reps you can do in a given timeframe, while also gradually raising your platform as you improve. Do this 4-move circuit twice through for a quick and effective workout in 12 minutes! Start with your feet hip-width apart. Step into a forward lunge on your right foot. Both of your knees should be bent at a 90-degree angle. Jump up out of the lunge and switch your legs. Land in a lunge, this time with your left leg in front. 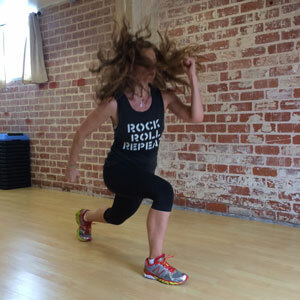 Continue alternating jump lunges as quickly as you can while keeping your chest high. You can use your arms for momentum and to help you balance. Do as many reps as you can in 90 seconds. Stand facing a moderately high platform or step with your feet shoulder-width apart. From here, bend at the knees and explode up on to the box. You can use your arms for momentum as you jump. Once on the box, jump back down to the ground. Do as many reps as you can in 90 seconds. Plyo pushups can be a bear, but they’re a killer way to strengthen your upper body. Start in a pushup position with your hands directly underneath your shoulders and your body in a straight line. (You can make the move easier by starting with your knees on the ground. Most people will need to do so because these pushups are very challenging!) 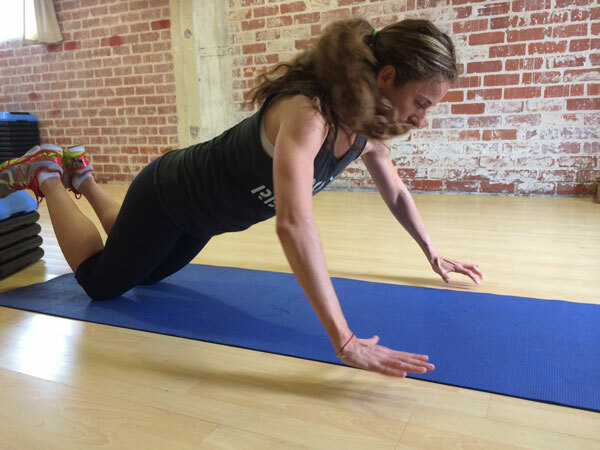 Keeping your core engaged, lower into a normal pushup. When you push up back up, explode up allowing your hands to leave the ground and get some air. Even if you can only get your hands an inch off of the ground, that is a-okay. When you land, lower straight back into a pushup. Do as many reps as you can in 90 seconds while still keeping your body in a strong, straight line. Stand with your feet hip-width apart and your toes facing out toward the corners of the room. Keep your shoulders back and your chest high. You can either put your hands on your hips or use your arms for momentum. Lower down into a sumo squat with your legs bent at 90 degrees. From here, drive yourself up into a jump. Your legs should straighten as your feet leave the floor, and your hips should thrust forward. As you land, lower back down into another sumo squat. Do as many reps as you can in 90 seconds, jumping as high as you can. Want more quick workout ideas? Try A 10-Minute Love Handle Workout or 5 Quick Workout Moves for Busy Women.